Hello! I was able to play along with this week's Sketch Challenge on Splitcoast and I decided to make a cute little spring inspired card:) I used these adorable images from the My Cute Stamps set Little Forest Friends, along with some new Echo Park Paper Co. Springtime dp. I hope you have a fun Friday! I'm heading to the gym (this is my 6th week of working out 4 days a week, and I'm starting to see results~yippee!, then to a chocolate factory for playgroup. I'm going to have to work out extra hard this morning because I know I won't be able to resist some dark chocolate covered pretzels~YUM!!! Thank you so much for stopping by! This is fabulous! So adorable! What a sweet card, Kerri! Enjoy your time at chocolate factory! 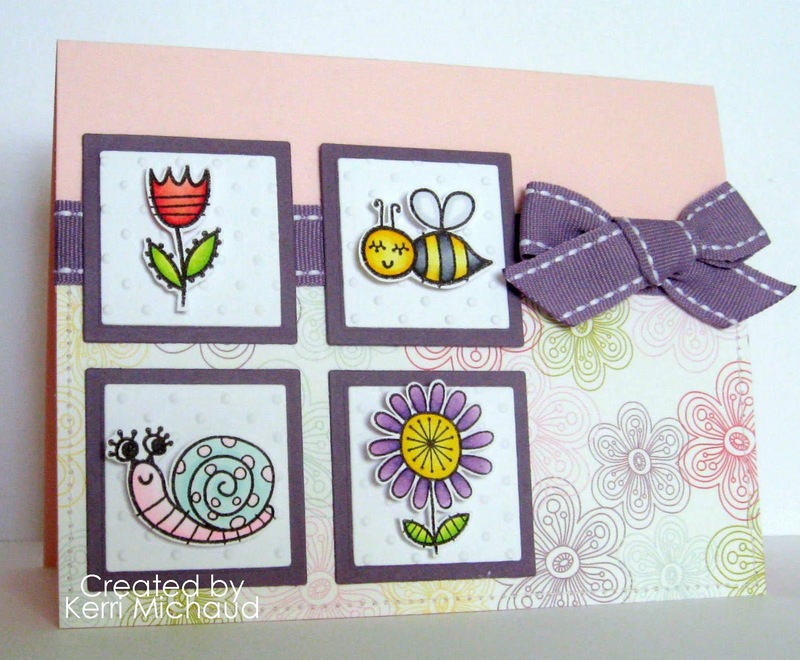 Kerri this is ABSOLUTELY Fabulous, I LOVE how you stamped the bottom of your card and those images are SWEET!!!!! What a great layout, colors, and design GF! Totally Springy-cute Kerri! Way to rock this sketch! SOOOOO cute Kerri! LOVe these images!!! Chocolate after workout now that is my type of workout. lol Kidding, its is nice to see the results of your hard work I agree. I've been selling girl scout cookies...hard to resist when you are freezing and starving while standing outside at a cookie booth.